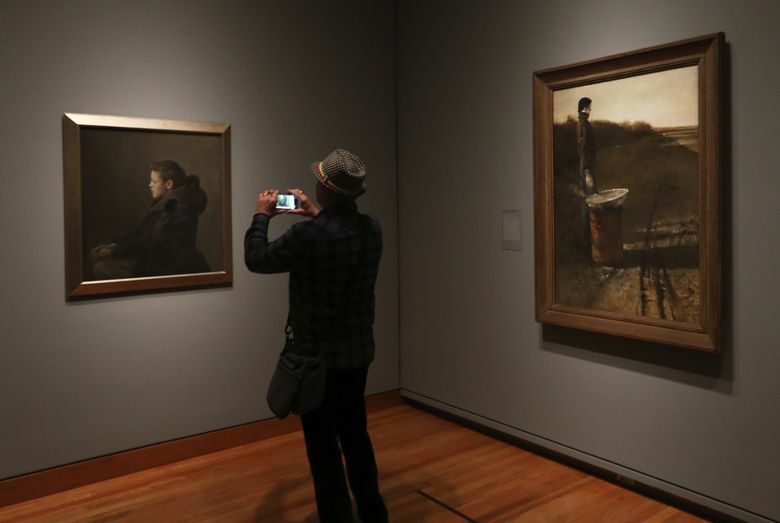 SAM’s “Andrew Wyeth: In Retrospect” lets you see Wyeth’s genius with fresh eyes. 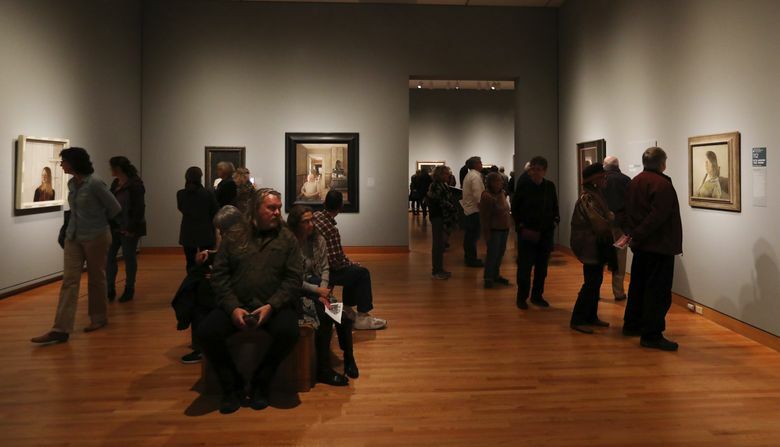 As you enter “Andrew Wyeth: In Retrospect” at the Seattle Art Museum, the paintings coming into view confound your expectations in several ways. First of all, they’re small. Reproductions of Wyeth paintings have circulated so widely over the last half century that they occupy epic-sized spaces in your mind. It’s a shock, then, to see “Karl,” Wyeth’s ominous 1948 portrait of his neighbor Karl Kuerner, measuring only 30-by-23 inches. But the pale space yawning between Kuerner’s stern face and a meat hook hanging from the ceiling above makes its impact enormous. 10 a.m.-5 p.m. Wednesdays-Sundays, 10 a.m.-9 p.m. Thursdays, through Jan. 15. Seattle Art Museum, 1300 First Ave., Seattle; $14.95-$24.95 (206-654-3100 or seattleartmuseum.org). Another point: Wyeth’s frames can be a key part of the picture. “Maga’s Daughter,” a 1966 portrait of his wife, has an embroidered linen border around it. Reproductions never show it, yet it’s essential: Betsy Wyeth’s upscale formality takes on an entirely different character when couched within this homespun touch. Several other paintings’ frames interact with their content in similar manner. Finally, seeing the paintings in the flesh lets you savor their texture in ways that don’t come across in reproduction. In “Sea Dog (study),” a tempera-on-hardboard panel of a Maine fisherman, the composition is eccentrically off-center and the rough texture of the featureless background makes you feel you’re seeing it through a sandstorm mist. True, it’s an exact representation of a man. But it’s also a brash experiment in what muted colors can do. The entire show lets you see Wyeth (1917-2009) with fresh eyes as it moves from his 1930s watercolors to his final painting in 2008. While he’s known as a figurative artist, large swathes of his paintings teeter toward abstraction. In “Trodden Weed,” for example — a 1951 self-portrait showing Wyeth from the knees down — the boots he wears boast a solid presence, yet the grass blades he’s trampling have the multidirectional mania of Jackson Pollock. SAM curator Patricia Junker, collaborating with Audrey Lewis of Pennsylvania’s Brandywine River Museum of Art (headquarters for all things Wyeth), doesn’t just illustrate the arc of Wyeth’s career. She illuminates his artistic process. His pencil-sketch studies for his paintings, for instance, offer fascinating contrasts to their end-products, and can be masterpieces in themselves. In “James Loper,” a tempera painting depicting Wyeth’s African-American neighbor, Loper’s contorted posture suggests he’s trying to shrink into the dim hues of the fence behind him. In the pencil-sketch version, however, Loper looms up inside his overcoat like a monument enduring the elements. 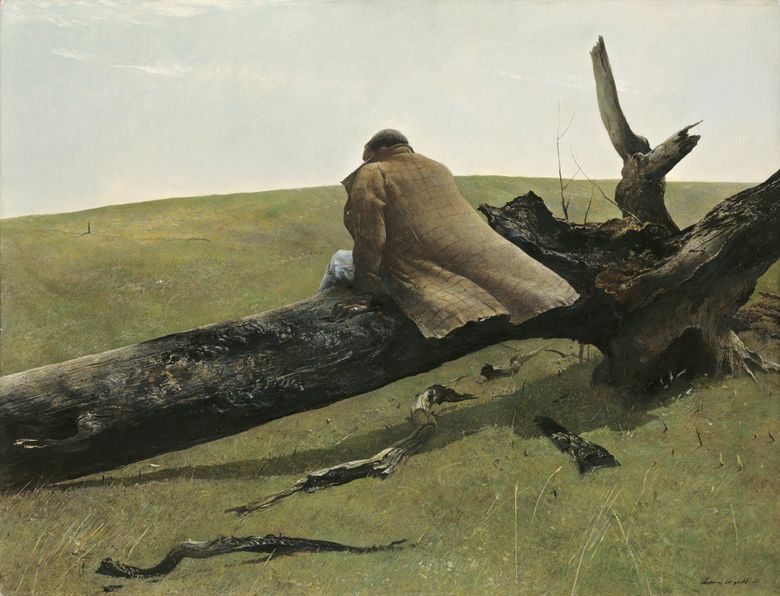 “April Wind,” a second tempera painting of Loper, this time huddled on a downed tree-trunk, captures his stoic side more than “James Loper” does. Wyeth often used his neighbors as a kind of repertory company. His wife likened him to Swedish film director Ingmar Bergman (“Scenes from a Marriage”), and “The Kuerners,” perhaps the best thing here, aptly resembles a scene from a spectacularly dysfunctional marriage. It shows the couple inextricably bound together not just by the years they’ve been married, but by grudges and an absent-mindedly pointed gun. The gaping space between them is their palpable hell. 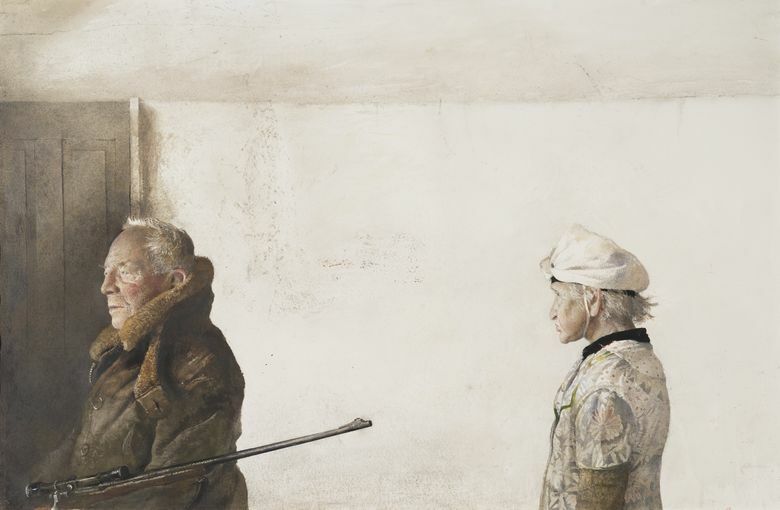 Here, as in so many Wyeth paintings, the busily brush-stroked “blank” portion of the painting is as animated as any depicted figure or object. That’s his genius at work.